In my role as a Director of Clinical Outreach other therapists often ask me how to build their professional network. I always tell them the same 3 things. First, building a professional network is similar to building a friendship. It is rooted in a genuine interest for another professional's career goals and passions. Second, creative networking means getting out of your comfort zone and building relationships with a variety of professionals. Lastly, creative networking involves having clarity around your own goals and passions, learning to articulate them in a way that builds networking bridges, and helps other professionals to feel excitement for passions. 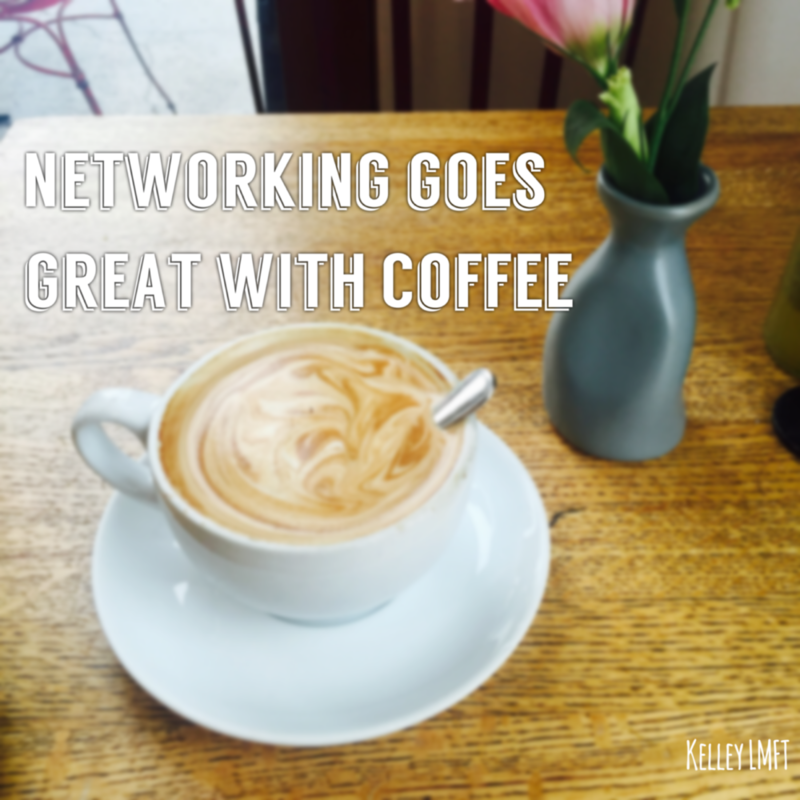 One of the easiest ways to connect with another professional is to ask them to coffee. When I take another professional to coffee I always make sure to focus on them. This is not a time for you to sing your own praises. This is the perfect opportunity to learn about the other professional. Learn what makes them passionate about what they do every day. Learn about what types of clients they see and why they love working with these types of clients. Try to really understand what brought this professional to the field and why they do the work they do. After graduate school at Pepperdine, five of my colleagues formed a "peer supervision group.” Shortly after we formed the group, we realized that we never actually did "supervision." Instead we found ourselves talking about our careers, our lives, work challenges, and brainstorming creative ways we could support one another in our career endeavors. We have been meeting for years now, and it has been one of the most incredible parts of my career journey. Feeling truly seen, heard, and understood by a group of women in my field has been fundamental to my growth process. I often suggest that other professionals form a group of just four or five trusted colleagues with whom you can share your career journey. Meet often but make sure to keep the conversation heart-centered. This is a time to connect, encourage each other’s growth, and support each other’s career development. Magic happens when four our five professionals meet regularly to discuss causes, clients, businesses, or ideas they are truly passionate about. Another great way to build your network is to join professional organizations. Most professional organizations meet monthly and are a great place to build contacts. I am a member of the Women's Association of Addiction Treatment, and I'm grateful for the community and camaraderie of this group of talented women. One mistake that many professionals make when attending a professional organization is in thinking that the entire value is in the actual meeting. This is false! The value of joining the organization is that it allows you to meet a large number of professionals in your field all at once. However you have to open the door! Challenge yourself to get very involved in one or two organizations. Volunteer for a leadership position or make sure to attend every meeting. I challenge myself to leave every meeting with 2 cards of people who I plan on following up with and asking to coffee. Although professional organizations are great for opening professional doors, nothing will happen if you don't get out of your comfort zone and take the steps of really getting to know others. I am absolutely not a detail-oriented person. However when it comes to interacting with other professionals I always take notes. Most people in our field initially started in the mental health world because of deeply rooted passions. As a result, many professionals have created businesses that are extensions of themselves and their own personal stories. Take the time to learn and remember what makes the professionals around you tick. If you take the time to remember the passions of others you will have opportunities to build networking webs. You may read an article about something a colleague specializes in and choose to send it to them. Or you might meet another professional who focuses on same specialty and then you can begin to build a networking web. For example if you meet two therapists (on separate occasions) who specialize in working with couples who have recently gone through bankruptcy you can be the one to connect these two therapists. Building networking webs helps us to strengthen not only each other’s businesses but also the mental health field as a whole.